......And even better news - you can see them for free!! They live on the breakwater at the end of the pier. 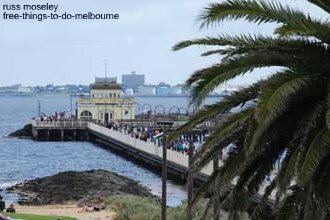 ..........We went all the way to Phillip Island to see penguins last year instead of taking a short drive up Beach Road!! 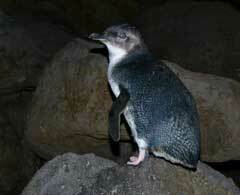 ........They're the world's smallest penguin apparently, about 30cm tall. You need to go along around dusk and you'll find them swimming in for the day and climbing the breakwater rocks into their nests. They often hang around on the rocks for a while as they're a sociable animal (with other penguins that is, not with you!). ......Actually there's a Seventhly and Eighthly too! - don't drop any litter and don't climb on the rocks. Please do follow all the rules - there were some people making quite a noise and using flashes when I went and it's very disturbing for the penguins. ........I did actually get there early enough to get a video of them though!